Raymond Chandleresque detective novel set in Virginia Beach, Virginia. That’s a famous tourist town. You’ve got the ocean, tourists, sand, and a hurricane. You’ve also got crime, murder, intrigue, suspense, blackmail, politics, danger, the usual components. PI Ben Morgan has to solve an array of interconnected crimes, keep himself alive, and if possible punish the bad guys and help the good guys. I read “The Big Sleep, and was very charmed by what Chandler had done with LA. I started to wonder what he would do with my hometown, Virginia Beach. 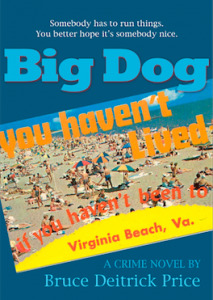 I finally wrote this book, as a tribute both to Virginia Beach and Raymond Chandler. All the things I experienced or heard about growing up, I put them in this novel. My father was a businessman and knew quite a bit more than the average citizen. Of course, I had to change things around so as not to offend anyone too directly. I wasn’t primarily interested in specifics. I was more interested in the spirit of the thing. For example, there was a political machine running the state of Virginia, the Byrd machine, and a local branch of that machine ran Virginia Beach. So I squeezed that power into one person. That would be Big Dog, said to be the city’s kingpin. Philip Marlowe is the famous tough-guy detective in Chandler’s books. He is the inspiration for probably hundreds of detectives. The one in Big Dog is younger and in many ways an ordinary guy. But you can’t be a detective unless you are brave and willing to go where a sensible person wouldn’t. The main thing you know about Ben Morgan is he was raised Catholic and, as he explains it, that probably explains his preference for simple cases where you have good guys on the one side and bad guys on the other side. As for all the other characters, there is a great range of them. I’ve always been good at inventing characters, and immediately knowing how they would walk and talk. She was a small girl with just the right amount of extra pounds. Her hair was brown and curly and her features could have used a little sharpening. She had a roundish face. The smile was as giddy as the average lunatic. She looked as if she had no secret vices and that she didn’t know what masturbation was. She was Uncle Charlie’s favorite niece. She was wearing white shorts. I was worried at first that she might be capable of anything. Then I realized that she was capable of very little and even then you would have to give her a good shove.